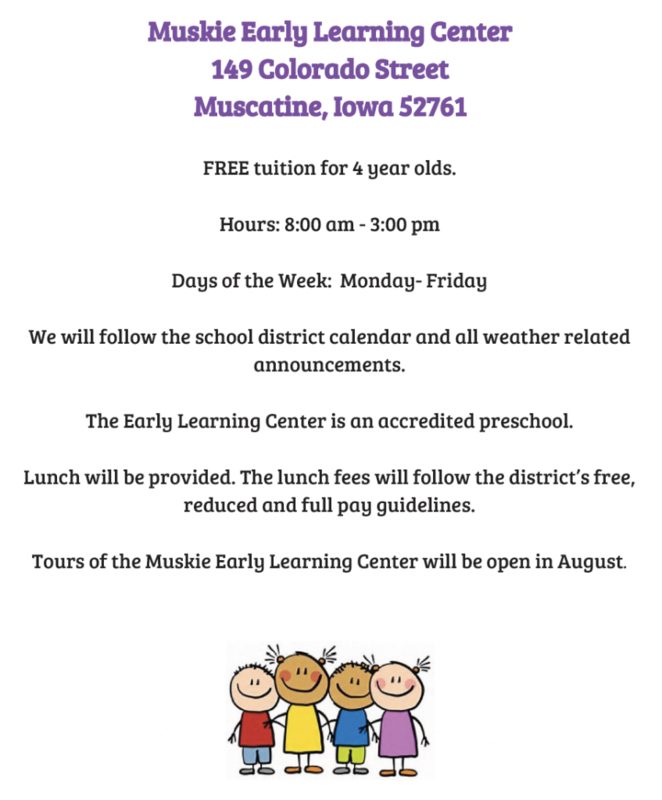 4-Year-Old Preschool Registration for the Muskie Early Learning Center for the 2019-20 school year opens January 15, 2019! January 15th: 8:00 am – 6:00 pm @ Muscatine Community School District Admin Center, 2900 Mulberry Avenue. January 16th: 8:00 am – 6:00 pm @ Muscatine Community School District, 2900 Mulberry Avenue AND YMCA, 1823 Logan Street. To register online, go to MCSD Enrollment/Registration. 4-year-old programs: To be eligible, your child must be 4-years-old by September 15, 2019, and live in the Muscatine Community School District. Birth certificate required at the time of registration. Immunization records will also be required. Please contact the Early Childhood Department at 563-263-7223 if you need assistance.